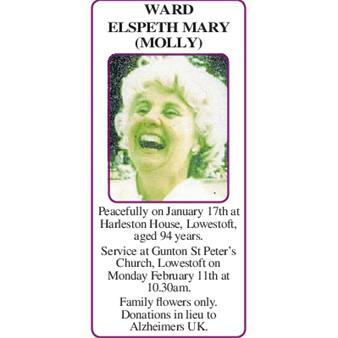 Originally printed on February 1, 2019 in the Lowestoft Journal. 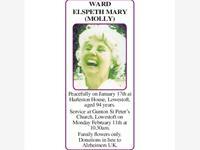 WARD ELSPETH MARY (Molly) Peacefully on January 17th at Harleston House, Lowestoft, aged 94 years. Service at Gunton St Peter’s Church, Lowestoft on Monday February 11th at 10.30am. Family flowers only. Donations in lieu to Alzheimers UK.